^ Budin, Itay; Devaraj, Neal K. (December 29, 2011). “Membrane Assembly Driven by a Biomimetic Coupling Reaction”. Journal of the American Chemical Society 134 (2): 751–753. doi:10.1021/ja2076873. PMC: 3262119. PMID 22239722. https://www.ncbi.nlm.nih.gov/pmc/articles/PMC3262119/. ^ a b c d e f Lombard, Jonathan (2014-12-19). “Once upon a time the cell membranes: 175 years of cell boundary research”. Biology Direct 9: 32. doi:10.1186/s13062-014-0032-7. ISSN 1745-6150. PMC: 4304622. PMID 25522740. https://www.ncbi.nlm.nih.gov/pmc/articles/PMC4304622/. ^ Gorter, E.; Grendel, F. (1925). “On bimolecular layers of lipoids on the chromocytes of the blood”. J. Exp. Med. 41 (4): 439–443. doi:10.1084/jem.41.4.439. PMC: 2130960. PMID 19868999. https://www.ncbi.nlm.nih.gov/pmc/articles/PMC2130960/. ^ Noutsi, Pakiza; Gratton, Enrico; Chaieb, Sahraoui (2016-06-30). “Assessment of Membrane Fluidity Fluctuations during Cellular Development Reveals Time and Cell Type Specificity”. PLoS ONE 11 (6): e0158313. doi:10.1371/journal.pone.0158313. ISSN 1932-6203. PMC: 4928918. PMID 27362860. https://www.ncbi.nlm.nih.gov/pmc/articles/PMC4928918/. ^ a b c d e Cooper, Geoffrey M. (2000). “Structure of the Plasma Membrane” (英語). The Cell: A Molecular Approach. オリジナルの2017-09-19時点によるアーカイブ。. https://www.ncbi.nlm.nih.gov/books/NBK9898/. ^ Abbott, Sarah K.; Else, Paul L.; Atkins, Taleitha A.; Hulbert, A. J. (2012-5). 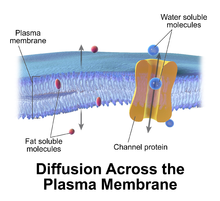 “Fatty acid composition of membrane bilayers: importance of diet polyunsaturated fat balance”. Biochimica Et Biophysica Acta 1818 (5): 1309–1317. doi:10.1016/j.bbamem.2012.01.011. ISSN 0006-3002. PMID 22285120. https://www.ncbi.nlm.nih.gov/pubmed/22285120. ^ Sinensky, M. (1974-2). “Homeoviscous adaptation--a homeostatic process that regulates the viscosity of membrane lipids in Escherichia coli”. Proceedings of the National Academy of Sciences of the United States of America 71 (2): 522–525. ISSN 0027-8424. PMC: PMC388039. PMID 4360948. https://www.ncbi.nlm.nih.gov/pubmed/4360948. ^ a b Lodish, Harvey; Berk, Arnold; Zipursky, S. Lawrence; Matsudaira, Paul; Baltimore, David; Darnell, James (2000). “Biomembranes: Structural Organization and Basic Functions” (英語). Molecular Cell Biology. オリジナルの2018-06-05時点によるアーカイブ。. https://www.ncbi.nlm.nih.gov/books/NBK21583/. ^ Mendez, Roberto; Banerjee, Santanu (2017). “Sonication-Based Basic Protocol for Liposome Synthesis”. Methods in Molecular Biology (Clifton, N.J.) 1609: 255–260. doi:10.1007/978-1-4939-6996-8_21. ISSN 1940-6029. PMID 28660588. https://www.ncbi.nlm.nih.gov/pubmed/28660588. ^ a b Brandley, B. K.; Schnaar, R. L. (July 1986). “Cell-surface carbohydrates in cell recognition and response”. Journal of Leukocyte Biology 40 (1): 97–111. doi:10.1002/jlb.40.1.97. ISSN 0741-5400. PMID 3011937. ^ Lodish, Harvey; Berk, Arnold; Zipursky, S. Lawrence; Matsudaira, Paul; Baltimore, David; Darnell, James (2000). “Post-Translational Modifications and Quality Control in the Rough ER” (英語). Molecular Cell Biology. https://www.ncbi.nlm.nih.gov/books/NBK21741/. ^ Cooper, Geoffrey M. (2000). “Transport of Small Molecules” (英語). The Cell: A Molecular Approach. オリジナルの2018-06-05時点によるアーカイブ。. https://www.ncbi.nlm.nih.gov/books/NBK9847/. ^ Kramer, Eric M.; Myers, David R. (2013). “Osmosis is not driven by water dilution”. Trends in Plant Science 18 (4): 195–197. doi:10.1016/j.tplants.2012.12.001. PMID 23298880. オリジナルの2017-09-12時点によるアーカイブ。. http://linkinghub.elsevier.com/retrieve/pii/S136013851200252X. ^ a b Alberts, Bruce; Johnson, Alexander; Lewis, Julian; Raff, Martin; Roberts, Keith; Walter, Peter (2002). “Membrane Proteins” (英語). Molecular Biology of the Cell. オリジナルの2018-06-05時点によるアーカイブ。. https://www.ncbi.nlm.nih.gov/books/NBK26878/. ^ Alberts, Bruce; Johnson, Alexander; Lewis, Julian; Raff, Martin; Roberts, Keith; Walter, Peter (2002). “Transport into the Cell from the Plasma Membrane: Endocytosis” (英語). Molecular Biology of the Cell. オリジナルの2018-06-05時点によるアーカイブ。. https://www.ncbi.nlm.nih.gov/books/NBK26870/. ^ Mishra, Nagendra N.; Liu, George Y.; Yeaman, Michael R.; Nast, Cynthia C.; Proctor, Richard A.; McKinnell, James; Bayer, Arnold S. (February 2011). “Carotenoid-Related Alteration of Cell Membrane Fluidity Impacts Staphylococcus aureus Susceptibility to Host Defense Peptides”. Antimicrobial Agents and Chemotherapy 55 (2): 526–531. doi:10.1128/AAC.00680-10. ISSN 0066-4804. PMC: 3028772. PMID 21115796. https://www.ncbi.nlm.nih.gov/pmc/articles/PMC3028772/. ^ Alexander, C.; Rietschel, E. T. (2001). “Bacterial lipopolysaccharides and innate immunity”. Journal of Endotoxin Research 7 (3): 167–202. doi:10.1177/09680519010070030101. ISSN 0968-0519. PMID 11581570. ^ YashRoy, R.C. (1999). “A structural model for virulence organellae of gram negative organisms with reference to Salmonella pathogenicity in chicken ileum”. Indian Journal of Poultry Science 34 (2): 213–219. オリジナルの2014-11-07時点によるアーカイブ。. https://www.researchgate.net/publication/230856732. ^ a b Saier, Milton H. (2013). “Microcompartments and Protein Machines in Prokaryotes”. Journal of Molecular Microbiology and Biotechnology 23 (4–5): 243–269. doi:10.1159/000351625. ISSN 1464-1801. PMC: 3832201. PMID 23920489. https://www.ncbi.nlm.nih.gov/pmc/articles/PMC3832201/. ^ “The fluid mosaic model of the structure of cell membranes”. Science 175 (4023): 720–31. (Feb 1972). doi:10.1126/science.175.4023.720. PMID 4333397. オリジナルの2009-02-08時点によるアーカイブ。. http://www.sciencemag.org/cgi/content/abstract/175/4023/720. ^ Kusumi, Akihiro; Shirai, Yuki M.; Koyama-Honda, Ikuko; Suzuki, Kenichi G. N.; Fujiwara, Takahiro K. (2010-05-03). “Hierarchical organization of the plasma membrane: investigations by single-molecule tracking vs. fluorescence correlation spectroscopy”. FEBS letters 584 (9): 1814–1823. doi:10.1016/j.febslet.2010.02.047. ISSN 1873-3468. PMID 20178787. https://www.ncbi.nlm.nih.gov/pubmed/20178787. ^ Hankins, Hannah M.; Baldridge, Ryan D.; Xu, Peng; Graham, Todd R. (2015-1). “Role of flippases, scramblases and transfer proteins in phosphatidylserine subcellular distribution”. Traffic (Copenhagen, Denmark) 16 (1): 35–47. doi:10.1111/tra.12233. ISSN 1600-0854. PMC: PMC4275391. PMID 25284293. https://www.ncbi.nlm.nih.gov/pubmed/25284293. ^ Albers, S. V.; van de Vossenberg, J. L.; Driessen, A. J.; Konings, W. N. (2000-09-01). “Adaptations of the archaeal cell membrane to heat stress”. Frontiers in Bioscience: A Journal and Virtual Library 5: D813–820. ISSN 1093-9946. PMID 10966867. https://www.ncbi.nlm.nih.gov/pubmed/10966867. ^ “Mediation, Modulation and Consequences of Membrane-Cytoskeleton Interactions”. Annual Review of Biophysics 37: 65–95. (2008). doi:10.1146/annurev.biophys.37.032807.125912. PMID 18573073. ^ Whatley, Jean M.; John, P.; Whatley, F. R. (1979-04-11). “From Extracellular to Intracellular: The Establishment of Mitochondria and Chloroplasts” (英語). Proceedings of the Royal Society of London B: Biological Sciences 204 (1155): 165–187. doi:10.1098/rspb.1979.0020. ISSN 0962-8452. PMID 36620. オリジナルの2017-11-07時点によるアーカイブ。. http://rspb.royalsocietypublishing.org/content/204/1155/165. ^ Alberts, Bruce; Johnson, Alexander; Lewis, Julian; Raff, Martin; Roberts, Keith; Walter, Peter (2002). “The Structure and Function of DNA” (英語). Molecular Biology of the Cell. https://www.ncbi.nlm.nih.gov/books/NBK26821/. ^ Alberts, Bruce; Johnson, Alexander; Lewis, Julian; Raff, Martin; Roberts, Keith; Walter, Peter (2002). “The Transport of Molecules between the Nucleus and the Cytosol” (英語). Molecular Biology of the Cell. https://www.ncbi.nlm.nih.gov/books/NBK26932/. ^ Cooper, Geoffrey M. (2000). “The Endoplasmic Reticulum” (英語). The Cell: A Molecular Approach. オリジナルの2017-10-03時点によるアーカイブ。. https://www.ncbi.nlm.nih.gov/books/NBK9889/. ^ Xu, Haijiao; Su, Weiheng; Cai, Mingjun; Jiang, Junguang; Zeng, Xianlu; Wang, Hongda (2013-04-16). “The Asymmetrical Structure of Golgi Apparatus Membranes Revealed by In situ Atomic Force Microscope”. PLOS ONE 8 (4): e61596. doi:10.1371/journal.pone.0061596. ISSN 1932-6203. PMC: 3628984. PMID 23613878. https://www.ncbi.nlm.nih.gov/pmc/articles/PMC3628984/.